UC Irvine Diabetes Center is dedicated to preventing diabetes, improving care and advancing science to find a cure. Today, more than 220 million people in the world live with diabetes. By the 2030, that figure is estimated to grow to 360 million, according to WHO. Diabetes knows no boundaries, socioeconomic level, skin color or gender. What we do know is that diabetes continues to cause life-threatening complications, and that one in three children will be diagnosed with diabetes in their adult lives. These statistics drive the UC Irvine Diabetes Center to action. As a clinical facility with staff endocrinologists, nutritionists and certified diabetes educators, the center treats the whole patient, not just the disease. As part of UC Irvine, a top-tier research institution, the center is at the forefront of research, with a multi-faceted, multi-disciplinary team of scientists from around the world who are actively pursuing better treatments to help diabetes patients live well today. 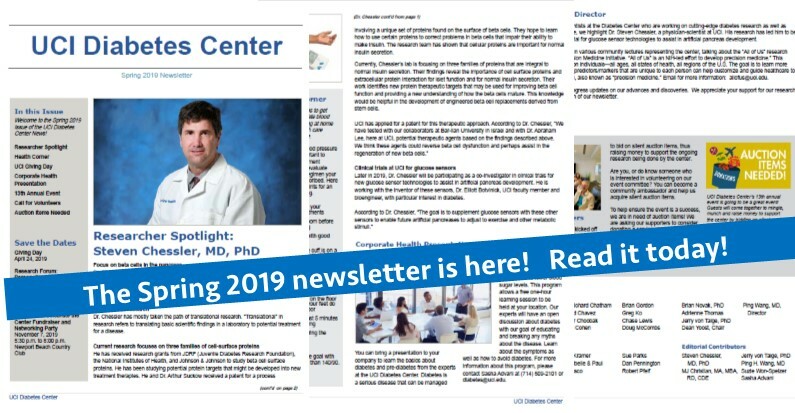 From understanding the cardiovascular complications of diabetes to an exciting development in the area of immune therapy, UC Irvine Diabetes Center has a team of world-renowned scientists and researchers working to find a cure. For some, a cure means an end to insulin shots and blood tests. For others, it means an end to complications. For all, we envision a world without diabetes.